So you want to live the Hangover 2 experience? 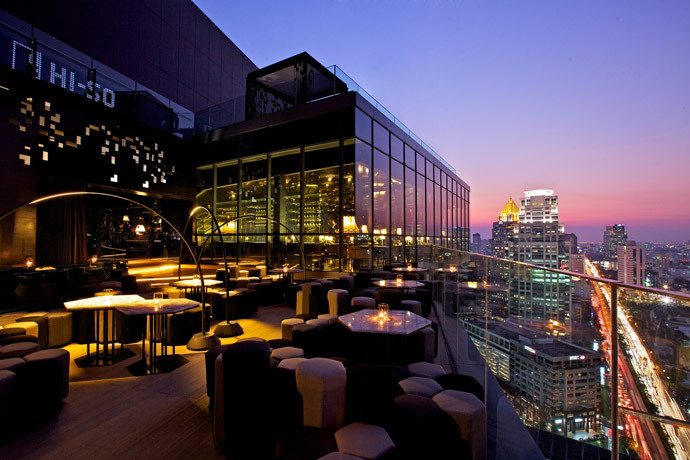 With our selection of the 5 best rooftops in Bangkok, you can order a nice cocktail while enjoying a stunning view of the city. 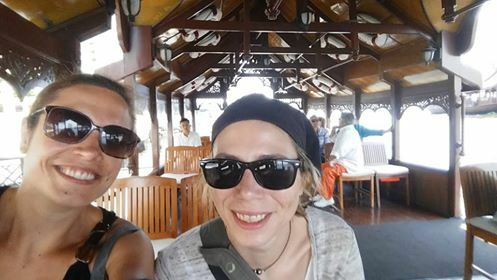 Let’s say it’s not the most welcoming place on earth, but cocktails are more than decent and you get to enjoy the Hangover experience. 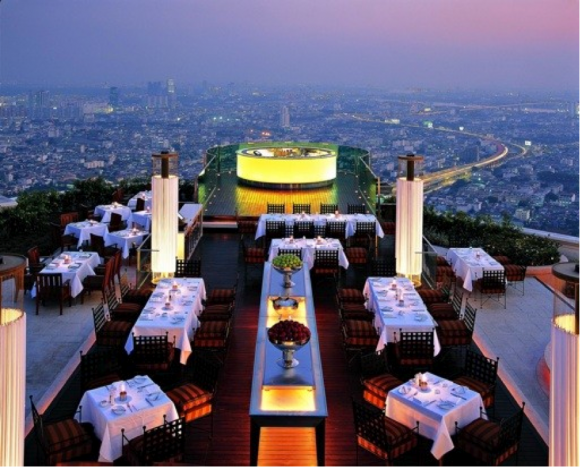 It’s the highest open-air bar in Bangkok. Enjoy the 63rd floor ! 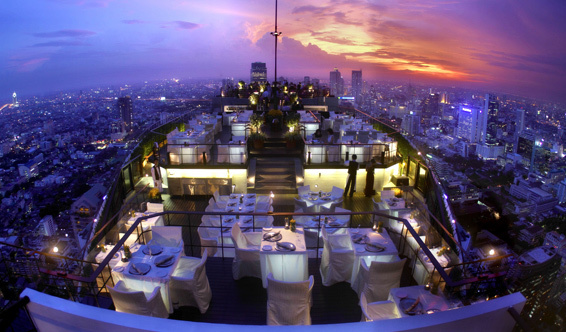 Lebua at State Tower, 1055 Silom Road. Why do we love it? 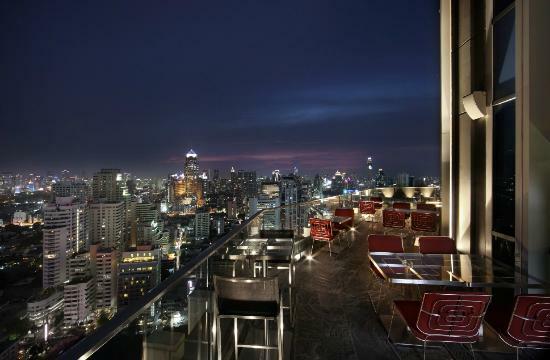 Because although the hotel is kind-of-getting-old-please-renovate-soon, the 360° view on Bangkok is breathtaking. Cocktails are amazing – the food a little less. Go there for a nice evening out ! The terrace is not that big, but God, what a wonderful place to enjoy a glass of champagne, nice wine or a cocktail (Happy Hour from 5 to 7 pm). Don’t miss the amazing French restaurant l’Appart, right inside and very close to the terrace. You’ll love it we promise. Come for an amazing dinner al fresco at the beautiful restaurant Elements : the view is greate and what a creative Chef! (he worked for Joel Robuchon for a while). You’d rather have a drink? The Up and Above Bar offers a great outdoor terrace (see the picture above). When it comes to a great lifestyle hotel, Sofitel So has it right. Designed by the French couturier Christian Lacroix himself, it also boasts a wonderful terrace called Park Society. Inside, a restaurant to .. let’s say, propose with a view. Outside, get the party going with a kind of “select” terrace and lounge bar, where you can also privatize an area called the Hi-So. Get your Amex now. It’s time.